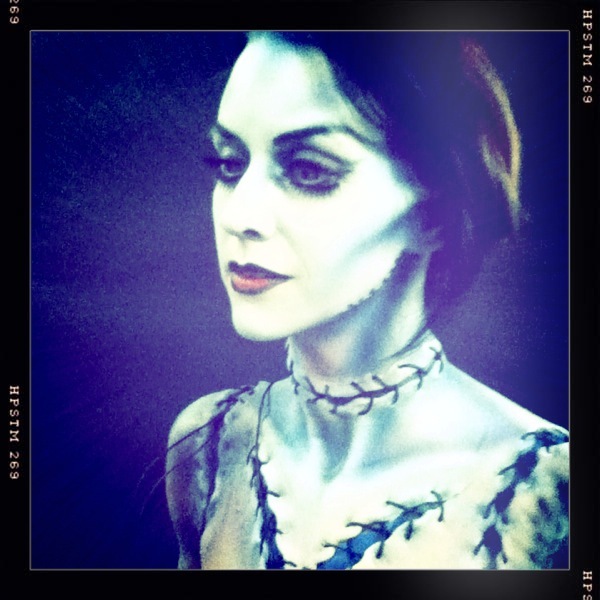 Yesterday we did a run through test for the Bride of Frankenstein makeup!! Let me tell you it was amazing!!! Next putting a base color all over getting everything primed and ready to airbrush…i love this super pale blueish color…her flesh is cold with death..
Than came the airbrushing details and adding the eyes!!!! Chaunsey has the most amazing eyes already but the purple not only looked super creepy but freakin GORGEOUS!!! I was so stoked to start lacing up her wounds!! I’ve always secretly wanted to stitch someone up 😉 hehe I may or may not have poked her several times….. haha nothing too major though! Getting the final layers of airbrushing done with lots and lots of stitching!!! Her skin is starting to look nice and gruesome..I love spines 🙂 need to make the stitches a little closer together but its coming together quite well! Can’t wait to see it all come together with the dress and hair!!! I’m just about finished with the dress but if you want to see you will have to come to these amazing shows!! Hair by the beautiful&talented: Janae Mechling Johnson and team. How did you make those awesome skin prosthetics? They are amazing! Are they latex?